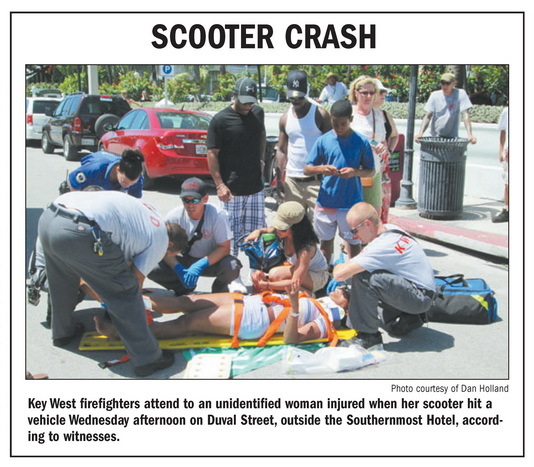 In its most recent issue, the Key West Citizen inserted a photograph of the driver of a scooter laying in the middle of the road, on a stretcher, receiving emergent care from Key West firefighters. Every year, millions of tourists visit the Florida Keys. While some of them are cruise passengers and can only stay less than a day, most tourists will spend an average of 3 days in and around Key West. The preferred mode of transportation is to rent a scooter and ride the Key West streets while enjoying the scenery. Scooters are fun to ride, cheaper than renting a car, and ideal for the streets of Key West. As fun as it sounds, riding a scooter or a moped is more dangerous than it seems, in Key West in particular. In 2000, Inside Edition reported on the death of Nicole Timmerman, 28 years old. She was on a cruise with friends when the ship made a scheduled stop in the port of Key West. The small group decided to rent scooters at one of the dozens scooter rental shops. Less than a few minutes after Nicole began riding the scooter for the first time, she died after crashing into a large truck. To this day, Nicole’s parents and friends who were with Nicole that day believe that she accelerated by error when she meant to brake. Further investigation showed that when Nicole rented her scooter, she was not given any instructions or recommendations by the scooter rental shop on how to ride and operate a scooter. In the 1980s, Key West saw the number of fatal accidents as high as three times the number of fatal accidents than the rest of Florida. Statistics revealed that fatal scooter accidents were on the rise as well. Every person in the business of renting mopeds or scooters to the public shall provide instruction and training to each customer in advance of the rental of the moped or scooter. Other provisions make it mandatory for scooter rental businesses to offer a helmet, to instruct renters on how to operate a scooter, how to safely ride a scooter in the streets of Key West, and a written document must be signed by the renter reflecting that the renter was instructed on how to safely operate the scooter. Despite the law that was passed in the mid 1980s, Key West, and to a larger extent Monroe County, continues to be plagued with a very high rate of fatal scooter and moped accidents. Tagged: "Key West Office", "key west", "Leesfield & Partners", "Monroe County", "Moped accidents" and "Nicole Timmerman"